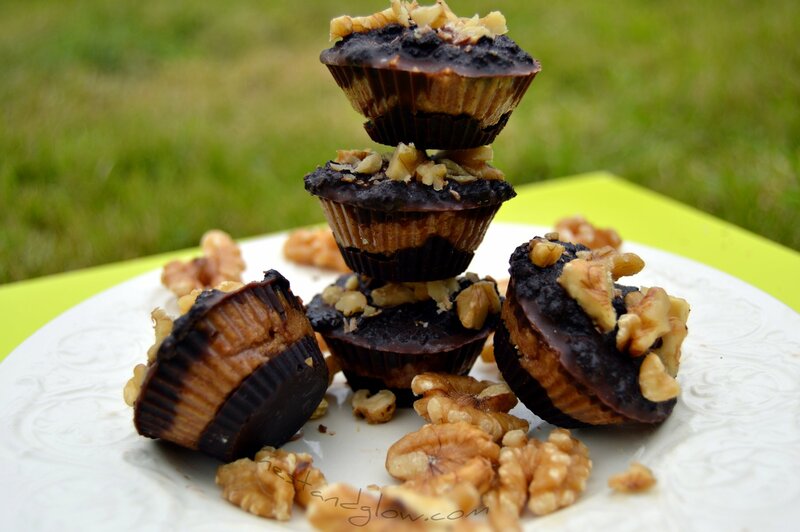 Healthy almond butter nut cups that are raw and full of nutrients. Similar to reese’s butter cups but made of natural and unrefined ingredients that make you feel good. 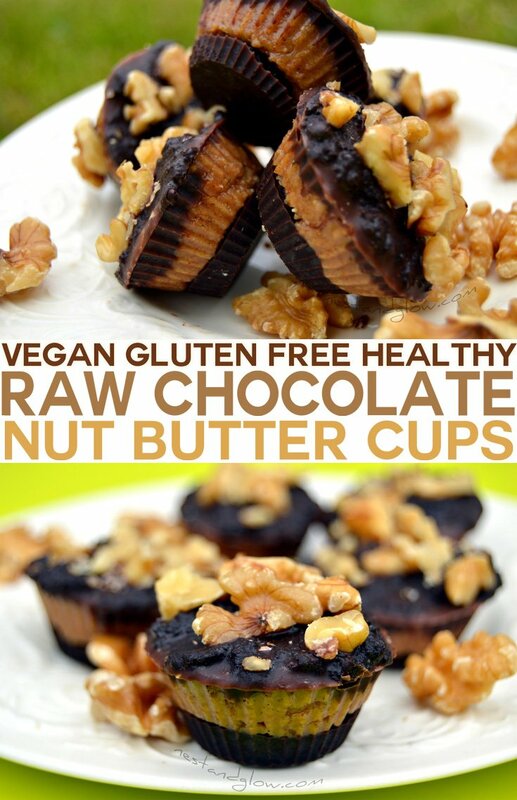 You can use any nut butter that you like for the centre – I like to use a raw almond butter. The shell is a raw chocolate made from cacao powder so they are dark with a rich depth of flavour. You can replace the maple syrup with date syrup / agave nectar or any other liquid sweetener. Use any nut you like to sprinkle on top. Melt the coconut oil in a double boiler / bain-marie (in a dish in hot water). You can use cacao butter if you prefer. Mix together the cacao powder, with the coconut oil and 3 tbsp of maple syrup. Keep mixing until smooth and combined, don’t worry if it seems a bit grainy – it will taste smooth when it’s set. Spoon half of the chocolate mixture into cup cases and place into the freezer. Spoon the nut butter centre on top of the chocolate cup cases, they should be set after 10 mins in the freezer. Spoon the rest of the chocolate on the nut butter and sprinkle with chopped nuts. Place back in the freezer and they should be set in 10 mins. Enjoy immediately or store in the fridge and eat within a week. I’ve also made versions of this from seeds using sunflower seed butter and tahini (pulped sesame seeds). Seeds make a butter cup that has an earthy taste. 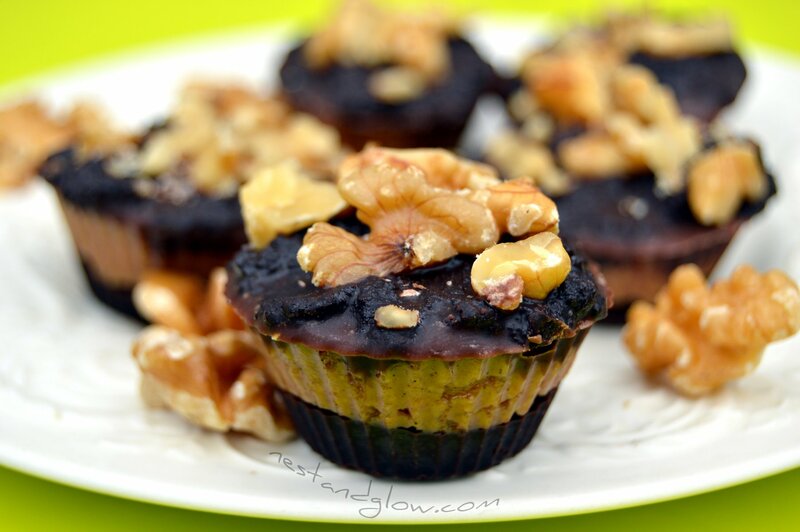 My favourite combination is raw chocolate with a tahini centre topped with shelled hemp seeds. Hi! IF I were to freeze and defrost in the refrigerator when I was ready to use how long would they last in the freezer ?